Do you ever just look in the fridge and wonder what you are going to make your family for dinner? I do this all of the time. I hate going out to eat and when we do, we usually just wish I would have cooked at hime. This recipe just happened to be a product of items that were only in my fridge. And let me tell you… it turned out fantastic! 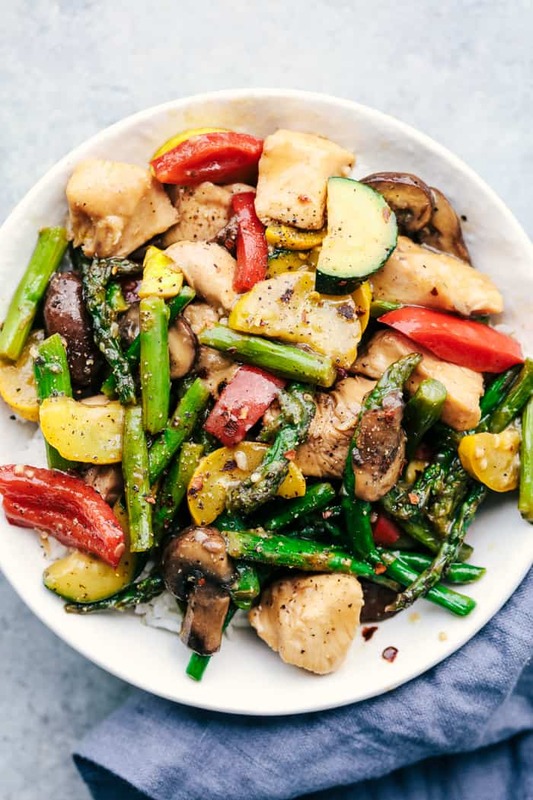 I usually keep a pretty good supply of vegetables in the fridge and this stir fry included asparagus, zucchini, banana squash, mushrooms and red peppers. It was such a delicious line up of vegetables. 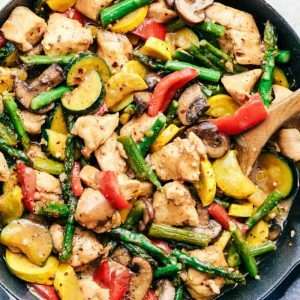 I love a good stir fry and they are the perfect meal in one. This one also included tender chicken and the savory honey garlic sauce just coats it so perfectly. We loved this meal and I know that your family will too! In a large skillet over medium high heat, add the olive oil. 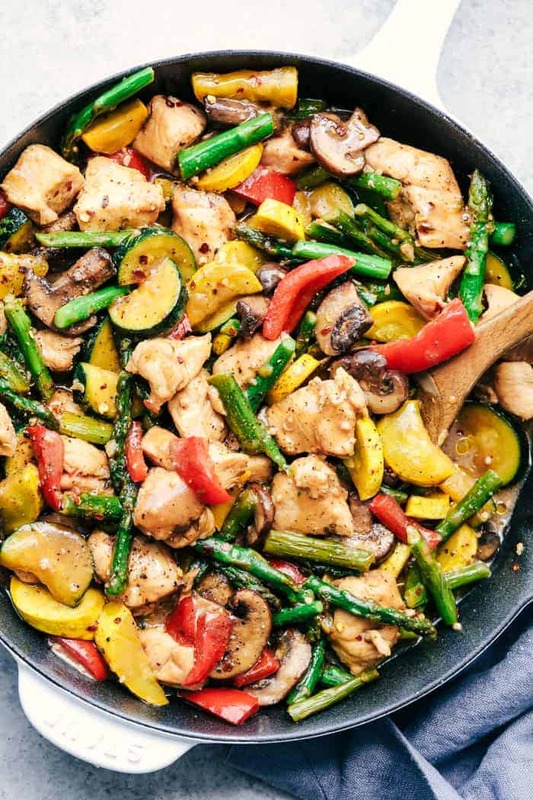 Sauté the veggies, asparagus, mushrooms, yellow squash, zucchini, bell pepper and salt and pepper until tender. Remove from the pan and set aside on a plate. Add the chicken and cook until tender and no longer pink. In a small bowl, whisk soy sauce, honey, sesame oil, chicken broth, garlic and cornstarch. Add the vegetables back to the skillet with the chicken and pour sauce on top. Simmer until sauce starts to thicken and serve over rice if desired. This easy SO delicious and easy to make. 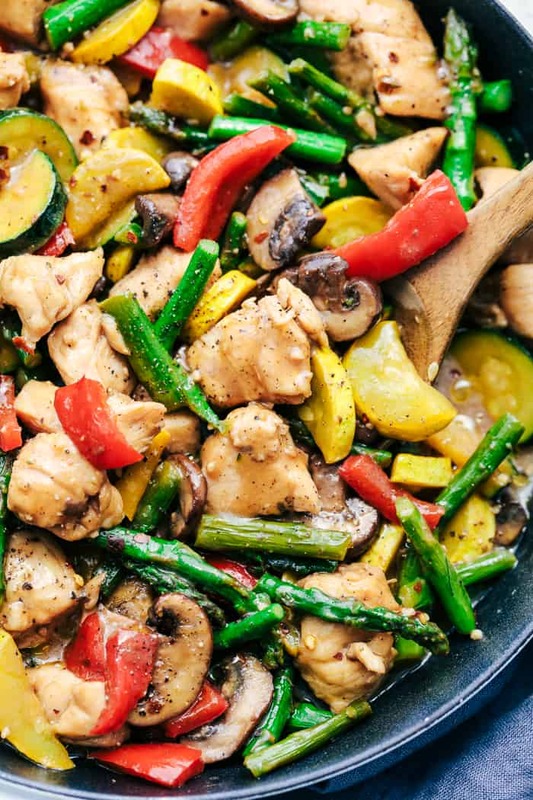 Definitely our new favorite stir fry. We couldn’t find yellow squash so I replaced it with snap peas. Thank you for this recipe! hey girl- this looks so delish! I made this for dinner tonight, and it was delicious! I will definitely be making it again! Do you recommend low sodium or regular soy sauce for this recipe? He had two helpings! It will be added to our family dinners. Thanks for the amazing recipe! Made the Honey Garlic stir Fry tonight for supper. Very easy and delicious. Used frozen stir fry veggies. Didnt have enough honey but we didn’t miss it either. Will make again. Would coconut aminos work in place of soy sauce? I’m assuming it would, but not 100% sure. I just made for our dinner and its so delicious . My family like it and for sure my in laws will like it too . Thank you for share your delicious recipe . Thanks for the recipes. Very appetizing!! Is there a calorie count on this? And what is a serving size? Easy and flavorful. The sauce is a winner. Definitely a keeper. All five of us loved it. Will be making this again soon. I’ve made this twice. My family loved it. The only thing that I changed was that, I added Yellow, Orange, Green Bell Pepper & Broccoli. It was very good. What step do you add the red pepper flakes in? I thought there was too much soya sauce. My dinner did not look like your picture. Aside from that it was very tasty. Will make again with less soya sauce. My daughter found this recipe, and we had to try. That is great to hear! Thank you for sharing! I am glad that your daughter found the recipe!